The 8th edition of the Collins COBUILD Advanced Learner's Dictionary offers up to date coverage of today's English in a clear, attractive format. This dictionary is ideal for upper-intermediate and advanced learners of English. It covers all the words, phrases, and idioms that students need to master in order to speak and write effective English. With full-sentence definitions written in simple, natural English, this dictionary is easy to use and understand. The examples, taken from the 4.5-billion-word Collins Corpus, show learners how the words are used in authentic contexts. The dictionary also provides extensive help with grammar, including grammar patterns for many of the examples, and a grammar reference in the supplement. A wide range of vocabulary building features, many of them with full colour illustrations, encourage students to expand and improve their accuracy and fluency. The dictionary also includes a Visual Thesaurus, which provides alternatives to the 50 most over used words in English; an Activity Guide, which helps students learn how to get the most out of the dictionary; a Writer's Handbook, which gives guidance on spelling, punctuation, letter writing and CVs, and a Speaker's Handbook, which gives advice on the best set phrases to use in specific situations. 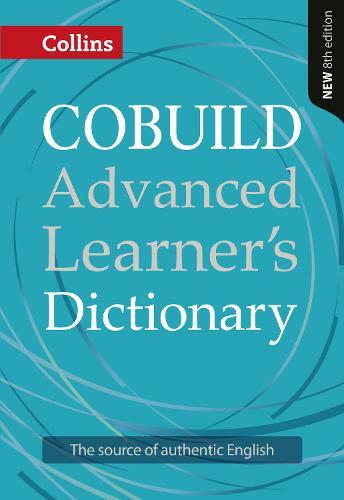 The Collins COBUILD Advanced Learner's Dictionary provides invaluable and detailed guidance on the English language, and is the complete reference tool for learners of English. The whole dictionary is a marvel to use. I particularly appreciate the inclusion of word web textboxes which provide detailed definitions for words.(...) The different topics covered in this dictionary make it an excellent reference resource for advanced learners in different fields and professions. Overall, this dictionary achieves its aims and successfully covers the main aspects of the English language. It is structured in a way that makes it usable in all fields.